Uređivanje fotografija, dodavanje dodataka danas je jako popularno. Noviji moderniji programi koji pružaju i određene grafičke mogućnosti dopuštaju veliku dozu kreativnosti svakog pojedinca. Međutim dodavajući nove elemente dobivamo i sasvim drugačije, inovativne fotografije. Koristeći programe koji ponekad mijenjaju cijelu kompoziciju fotografije dobivamo novo djelo, novi prikaz, novu poruku koju slika prikazuje. 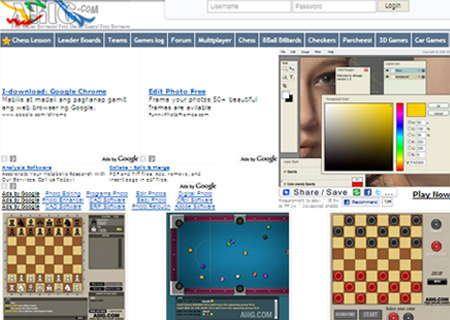 Sliku obrađujemo online koristeći ono što nam određeni program pruža. Kad je uređivanje fotografije gotovo svaki od programa omogućava spremanje fotografije na računalo ili dijeljenje putem društvenih mreža. U samo nekoliko pokreta (klikova) mišem u mogućnosti smo napraviti naše malo "remek djelo" od naših fotografija, stvoriti smiješne slike, kolaže, naslovnice magazina, biti na trenutak poznata osoba. Rad s programima za obradu slika pruža neviđene mogućnosti za rad u razredu individualno ili grupno. Ovdje je 50 najčešćih programa (većinom besplatnih) za obradu fotografija, vi pronađite onaj koji je vama najjednostavniji. Očekujemo barem desetke odličnih fotografija na našoj FB stranici. 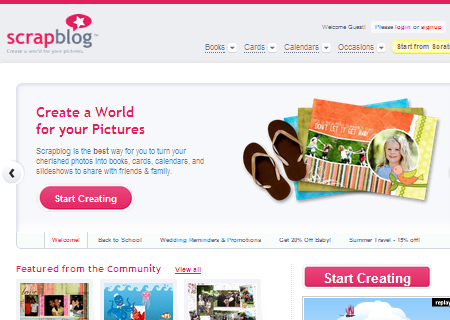 Scrapblog dozvoljava kombinaciju fotografija, videa, audio zapisa i tekstova za stvoriti knjige sjećanja i uspomena. 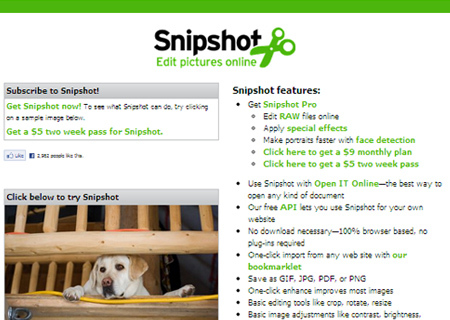 Snipshot se nekada zvao Pixoh.uređujte sliku online. 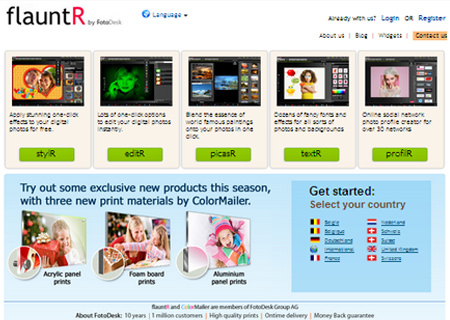 Pixer.us možete iz fotografije izvući detalj koji želite, igrati se s bojama. PicMagick ima mnoštvo dodataka s kojima običnu fotografiju možete učiniti posebnom. Pikipimp posebno ima dodatke koje lijepite na fotografiju kao što su oblačići, tekst, gotovi elementi. 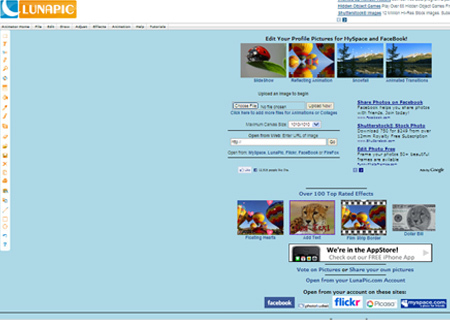 Mypictr služi za smanjivanje veličine fotografije te izradu avatara za društvene mreže. Picture2Life uređivanje fotografija, izrada kolaža,dodavanje elemenata. 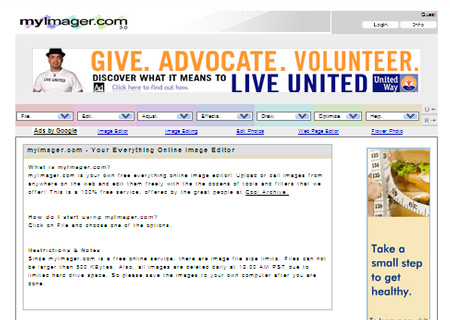 MyImager could allow you to work with an existing photo via upload or a URL. 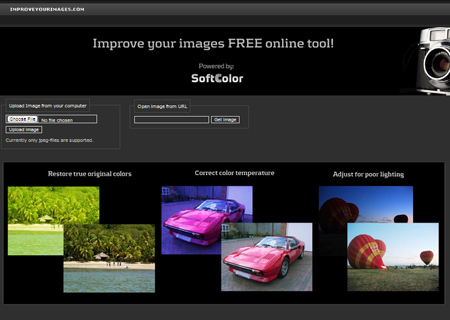 It could make your images look even more beautiful though the various tools that are available, including a number of adjustments and effects, drawing tools, and more. 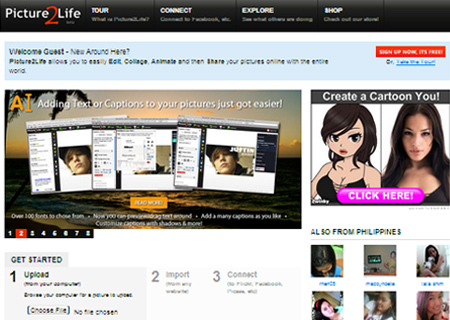 FlauntR includes fetaures like one-click effects and a profile image creator for over 30 social networks. 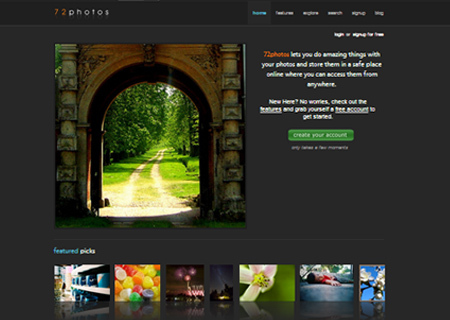 72photos allows to store your photos online with high and customizable quality. DrPic includes basic functionality like cropping and re-sizing, brightness and contrast adjustments, sharpen, adding text, and a little more to make your images look fabulous. 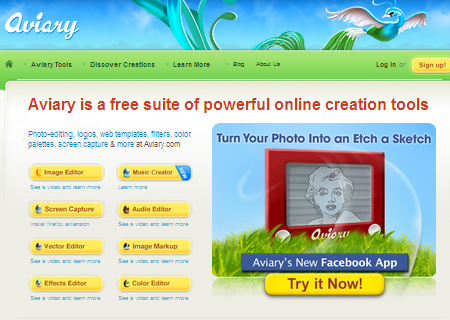 Aviary allows you to edit images, topography, audio and color. AlilG includes some basic photo editing tools which allows you to create a new image, edit it and import photos to your image document. 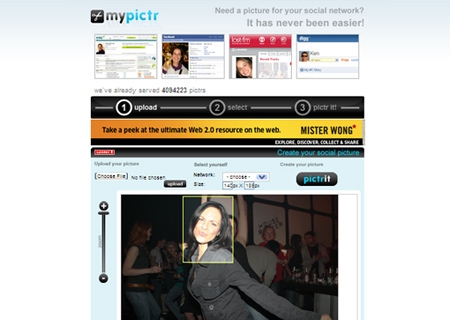 LunaPic allows you to edit your profile pictures for Facebook and Myspace. 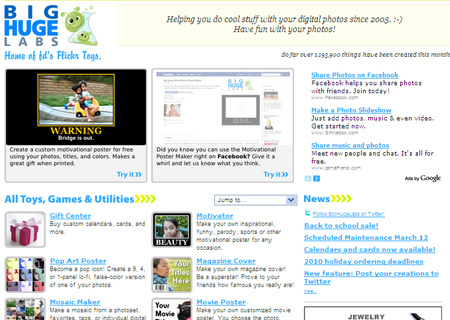 Picnik includes a number of special effects from artsy to fun. 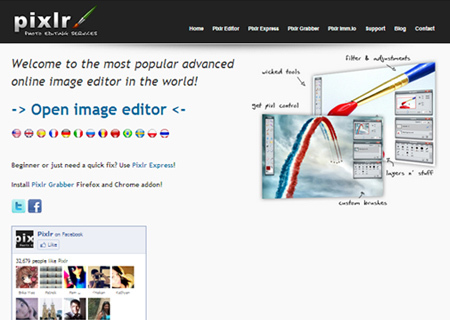 Online Image Editor allows you to edit your pictures online. 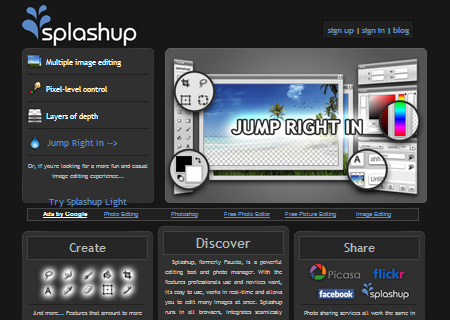 Splashup is formerly known as Fauxto. 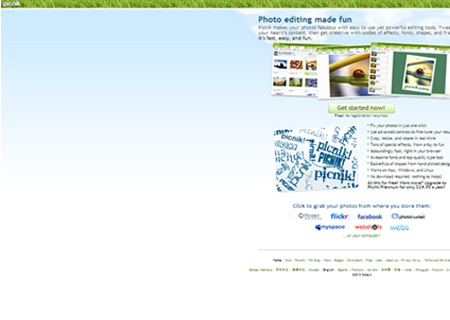 It has a lot of tools and features for a free online image editing. 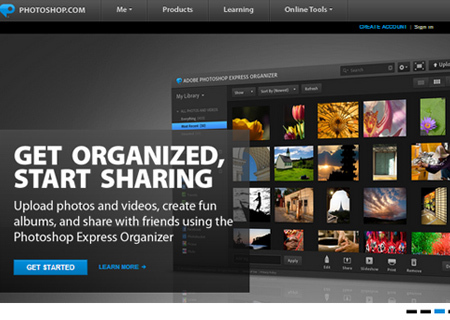 Photoshop has a lot of tools needed for basic photo editing. It will allow you to crop and re-size, apply basic touch ups, work with color, or edit the photo by adjusting the sharpness, focus and more. 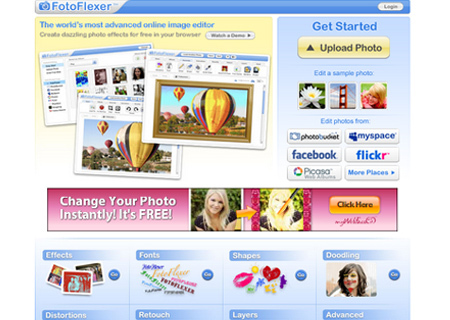 FotoFlexer integrates all the major online photo services, such as Flickr, Photobucket or Facebook. 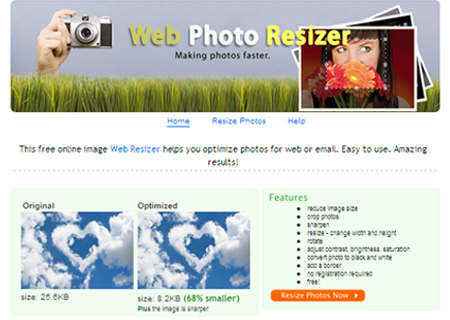 Web Photo Resizer allows you to resize your photos online. 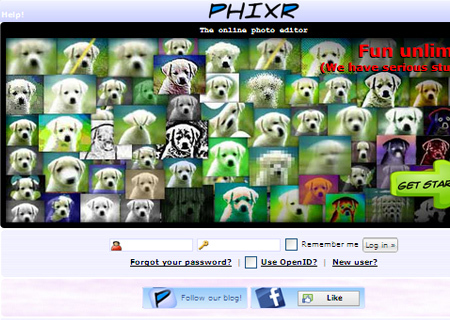 PHIXR allows basic operations like cropping or resizing, or using the other options like red eye removal, camera and lense effects, blur, and more. 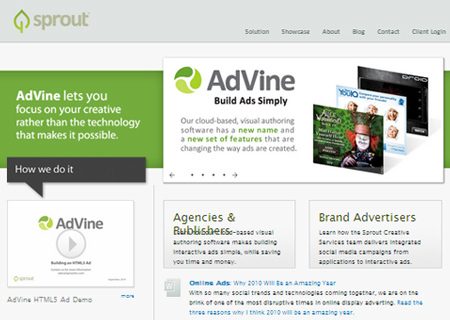 Sprout helps you create living content including banners, videos, photos, RSS feeds, calendars and more. 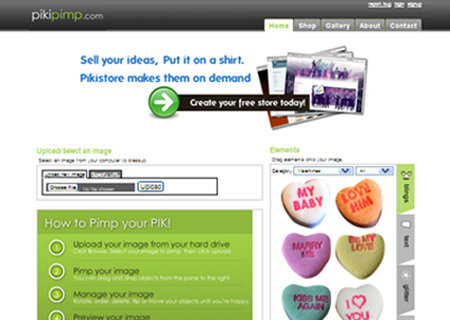 pixlr allows you to create an item from scratch or edit an existing photo. 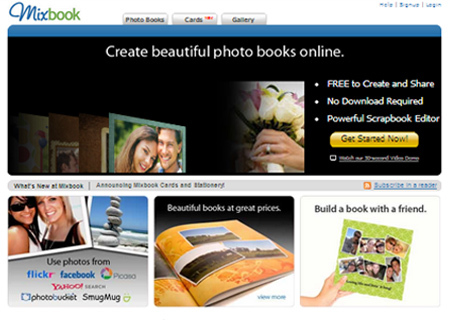 Mixbook allows you to create a beautiful photo book out of your photos. 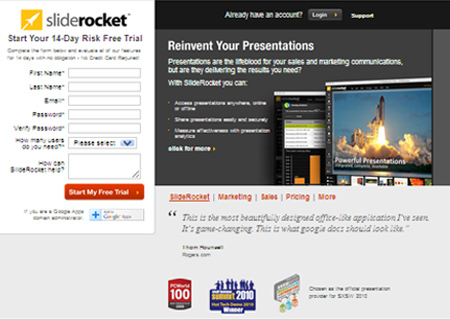 Sliderocket is an online presentation platform that allow users to deliver presentations. 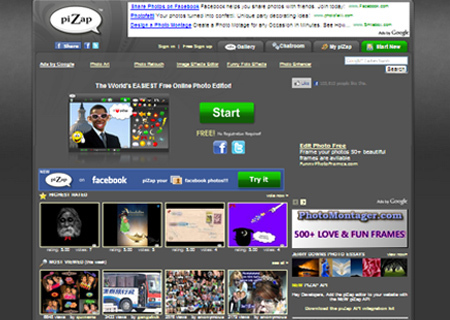 piZap allows you to create something fun with your photos by adding speech bubbles, cutout faces, effects and more. 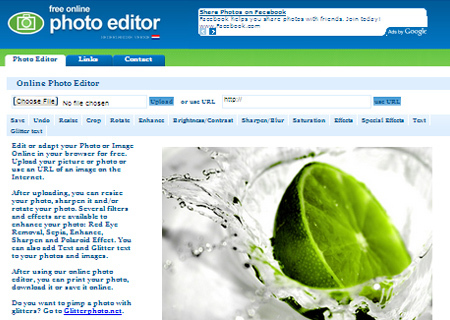 Free online photo editor includes basic functionality like cropping, re-sizing, brightness/contrast adjustments, working with text, and a number of effects. 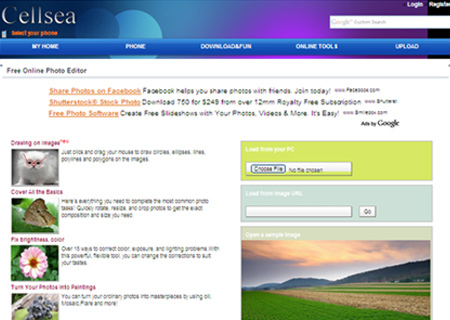 Cellsea makes it easier for you to not just edit your photo but also to edit your video as well. 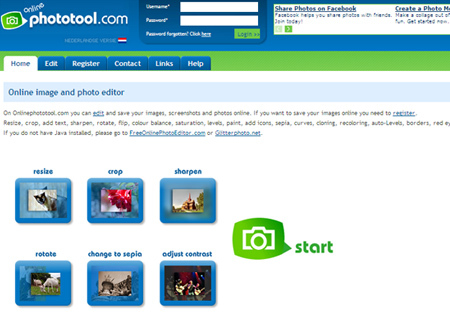 Online Photo Tool allows you to do basic editing, and images can be saved if you register. 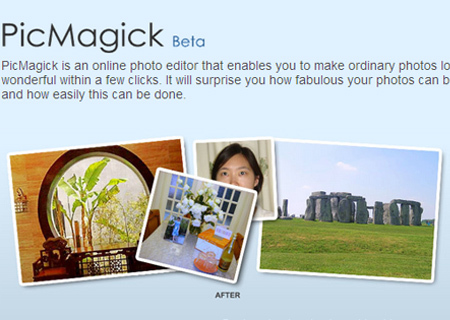 Befunky helps you create marvelous effects to your photos in just a single click. 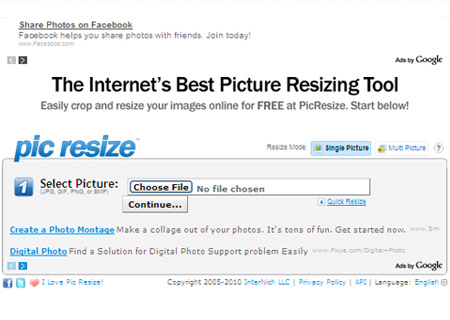 Pic resize includes tools like batch resize, crop, blur, polaroid and some effects. 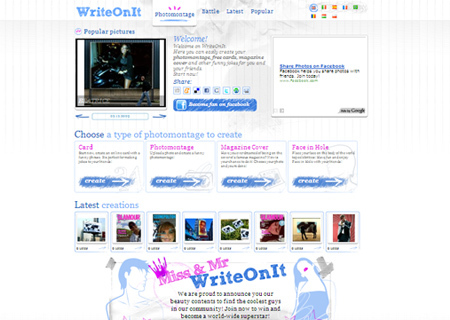 Write On It creates photomontage, free cards, magazine covers, funny photos and more. 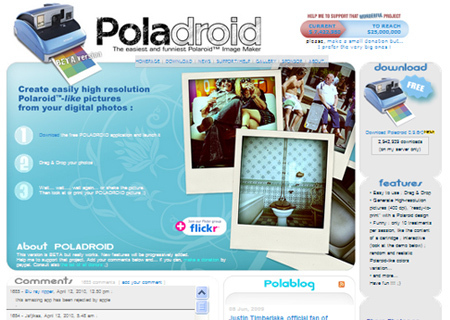 Poladroid helps you to turn your photos into polaroid-style photos. 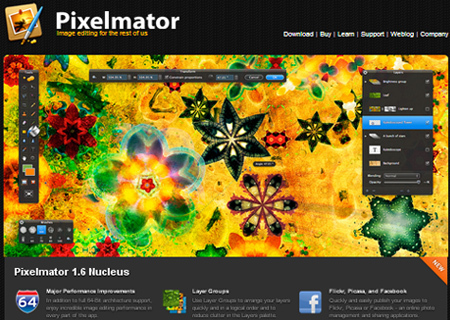 Pixelmator is a graphic editor developed for Mac OS X which includes features like selection, painting, retouching, navigation, and color correction tools. 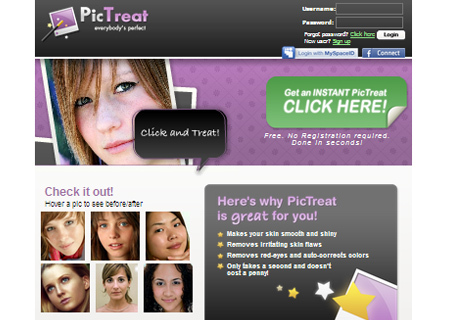 PicTreat automatically retouches photos, including skin smoothing and red-eye removal. 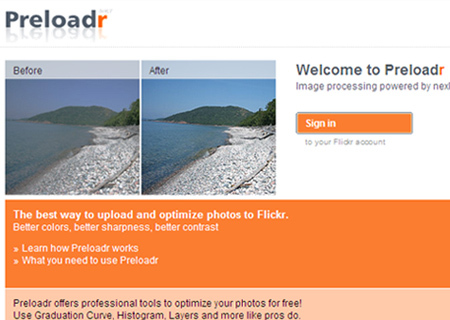 Preloadr offers professional tools such as cropping, sharpening, color correction to enhance and optimize your photos. 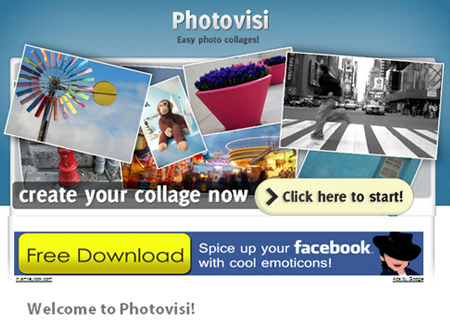 Photovisi could help you create a collage from your photos. 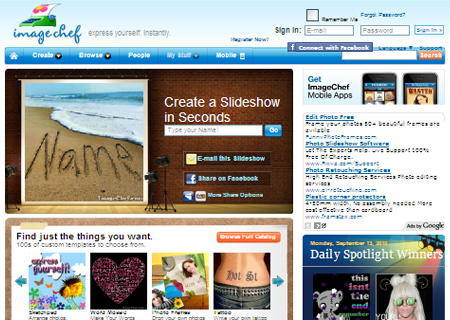 ImageChef allows to use the sketchpad to create your own work, word mosaics, photo frames and more. 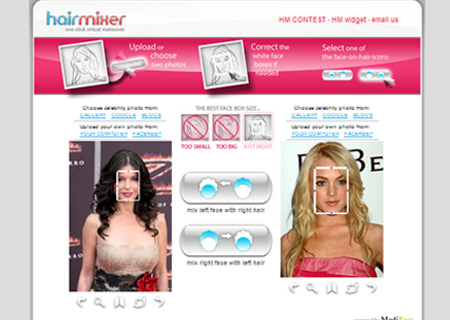 Hairmixer allows you to mix and try different hairstyles to give yourself a free virtual makeover. 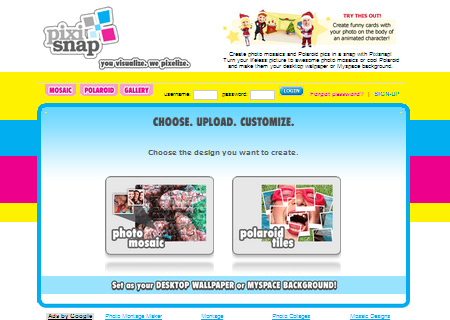 Pixisnap helps you create mosaics or polaroid tiles out of your images. 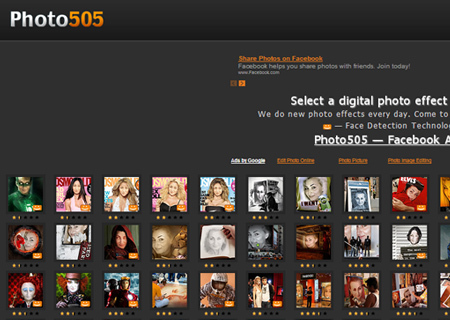 Photo505 helps you create cute and funny effects to your photos by uploading it and choosing from a number of pre-made effects and filters. 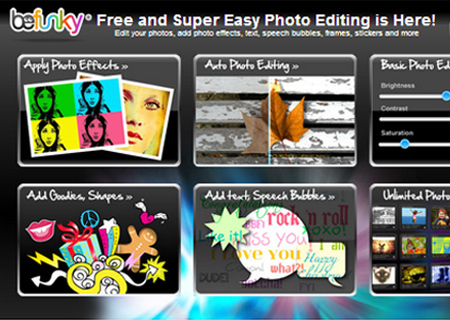 AnyMaking adds fun effects to photos, like the retro comic effect, cartoon effect, wanted poster, and more. 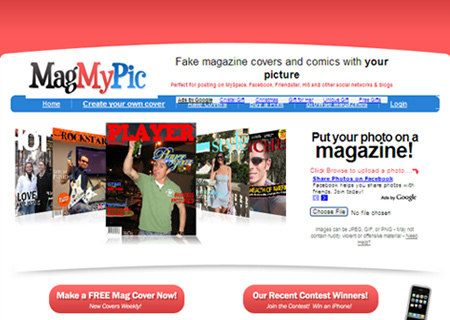 MagMyPic allows you to put your photo on a magazine cover like that of a celebrity. 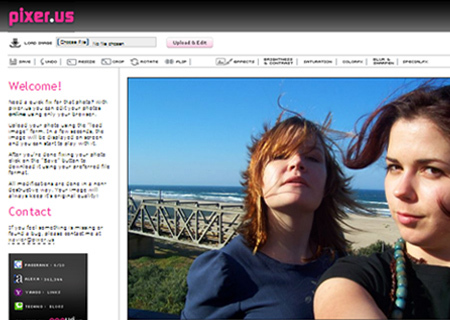 BigHugeLabs can help you create things like CD covers, pop art posters, magazine covers, billboards and more using your own photos. 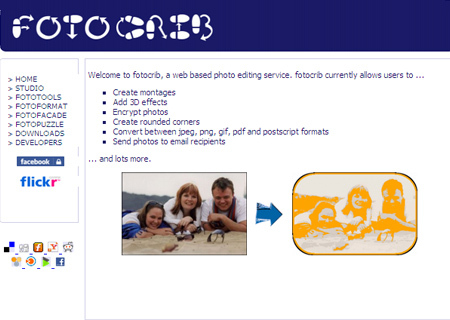 Fotocrib includes extra features that allows you to add a 3D effect, encrypts your photos and others. 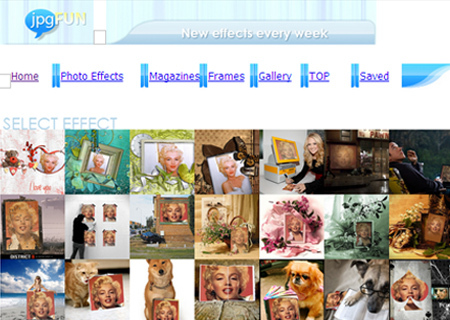 jpgFUN includes photo effects that allows you to create exclusive avatars and images using your personal photos. 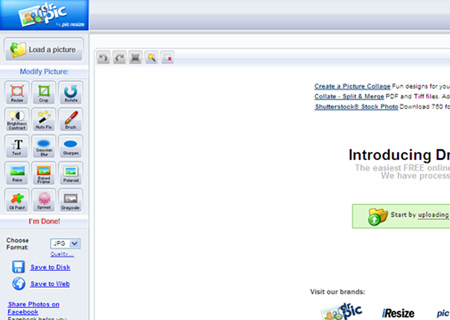 Blingee allows you to create custom glitter graphics and comments to your photos. 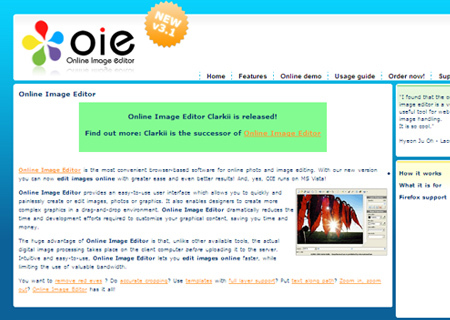 Improve your images allows you to fix a photo to make it look fantastic. 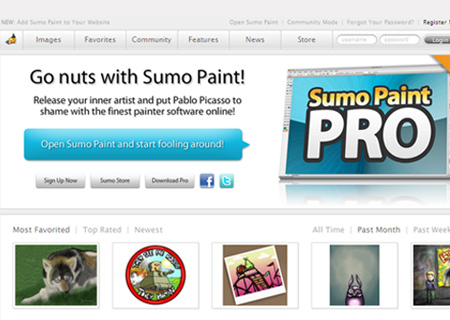 Sumo Paint includes features like brushes, layers and shape tools that helps you improve your images. 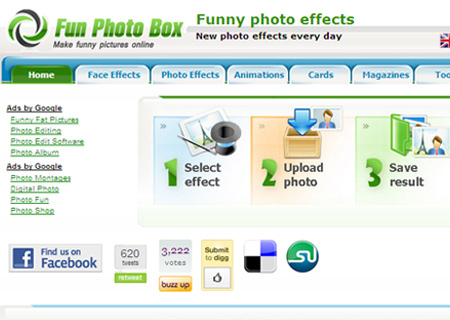 FunPhotoBox lets you create funny photos and gift animations from your pictures.